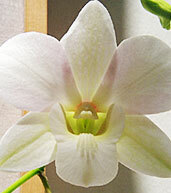 This Asian beauty is typical of the white flowering hybrids sold at the busy markets of Singapore and Thailand. White Fairy's drooping canes and star-shaped blossoms make this one of the most elegant orchids available today. 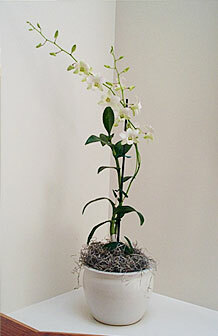 Its jasmine scent is sweet and gentle in the early morning and becomes stronger in the late afternoon. The plant stands approximately 2-3 feet tall and shipped with 7-12 buds. The blooms measure 2.5 inches in diameter. Plants are shipped in bud approximately 1 week before blooming. The buds will open gradually, growing more spectacular by the day for up to 4-8 weeks. 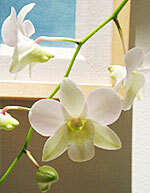 This way, you get to enjoy the full blooming stage of this magnificent plant--only from Beautiful Orchids.